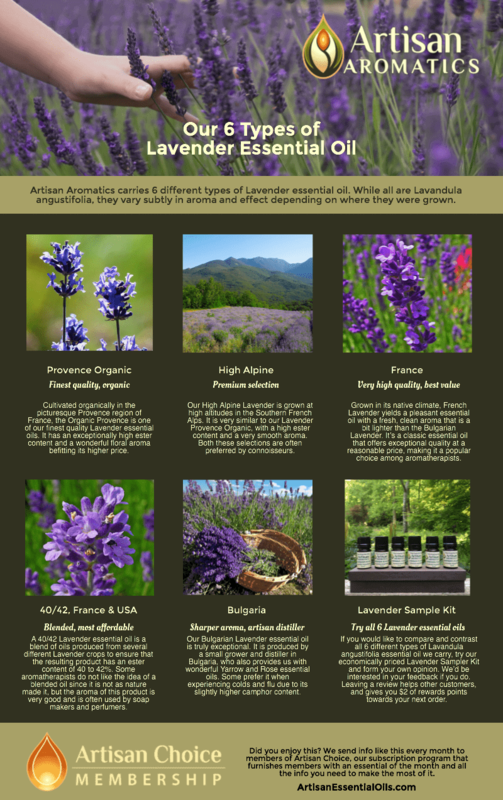 Artisan Aromatics carries 6 different types of Lavender essential oil. While all are Lavandula angustifolia, they vary subtly in aroma and effect depending on where they were grown. Cultivated organically in the picturesque Provence region of France, the Organic Provence is one of our finest quality Lavender essential oils. It has an exceptionally high ester content and a wonderful floral aroma befitting its higher price. Grown in its native climate, French Lavender yields a pleasant essential oil with a fresh, clean aroma that is a bit lighter than the Bulgarian Lavender. It’s a classic essential oil that offers exceptional quality at a reasonable price, making it a popular choice among aromatherapists. A 40/42 Lavender essential oil is a blend of oils produced from several different Lavender crops to ensure that the resulting product has an ester content of 40 to 42%. Some aromatherapists do not like the idea of a blended oil since it is not as nature made it, but the aroma of this product is very good and is often used by soap makers and perfumers. Our Bulgarian Lavender is truly exceptional. It is produced by a small grower and distiller in Bulgaria, who also provides us with wonderful Yarrow and Rose essential oils. Some prefer it when experiencing colds and flu due to its slightly higher camphor content. If you would like to compare and contrast all 6 different types of Lavandula angustifolia essential oil we carry, try our economically priced Lavender Sampler Kit and form your own opinion. We’d be interested in your feedback if you do. Leaving a review helps other customers, and gives you $2 of rewards points towards your next order. We hope this infographic was helpful to you! Let us know of any questions in the Comments section.